If you have ever loved someone crazily and madly then the newly released title track of the movie “Ashi Hi Ashiqui” would be the perfect ode to your soulmate. Swayam and Amarja will express their “Ashiqui” through this romantic track “Teri Meri Meri Teri Ashiqui” and from today you too can dedicate this song to your special someone. 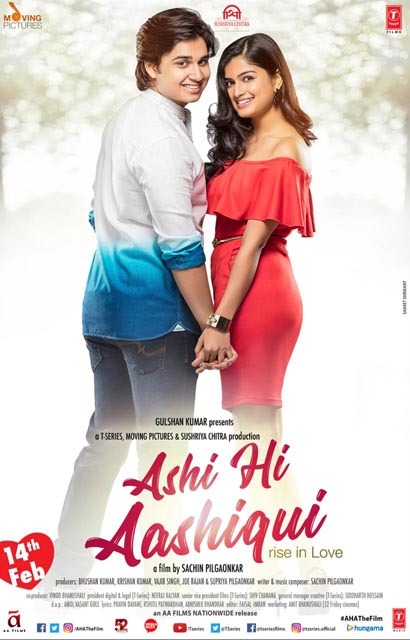 Gulshan Kumar presented, T-Series’ Bhushan Kumar and Krishan Kumar has produced “Ashi Hi Ashiqui”. Its music and direction is done by Sachin Pilgaonkar. The romantic title track “Teri Meri Meri Teri Ashiqui” with lead roles played by Swayam and Amarja was shot at the beautiful and romantic place named “Arosa” in Switzerland. After watching the song one can surely say that Marathi cinema is no less than any Bollywood films. Not just the location but the soulful voice of both our singers Sonu Nigam and Priyanka Barve, Sachin Pilgaonkar’s ‘Hatke’ music that will instantly touch your heart and lyrics by Abhishek Khankar will definitely make everyone to fall in love again. This unpredictable and simple tale of love stars Abhinay Berde as Swayam and Hemal Ingale as Amarja. Moving Pictures and Sushriya Chitra produced “Ashi Hi Ashiqui” has also been co-produced by Vajir Singh, Joe Rajan and Supriya Pilgaonkar. This beautiful saga of love “Ashi Hi Ashiqui” is soon coming to your theatres to celebrate AHA Day on 14th February!!! Don’t forget to watch it with your loved ones and be a part of this celebration called Love!!! !